The move to new, larger headquarters and expansion of its global team will support growing demand for the Atheer AR enterprise solutions and technologies. SANTA CLARA, CA, OCTOBER 9, 2018 – Atheer Inc., a leader in enterprise augmented reality (AR) solutions, today announced that it is moving into new markets (including Europe, the Middle-East, Africa, Latin America and the Caribbean), has hired a deep bench of new senior management talent and additional sales and engineering team members and is moving to new larger headquarters at Mission College Boulevard, Santa Clara, California to support its continued growth. The company’s push into Europe is led by new General Manager for EMEA Olivier Ghezi. He is deeply familiar with both the opportunities and challenges of the enterprise software market in the region, having been responsible for launching and establishing Saba Software in Europe and also having held senior sales, alliances and consulting management positions at InfoVista, Baan, Atos, IBM and other IT companies. He holds an MBA in International Business from Schiller International University and Master in Computer Science from Université Paris-Est Créteil (UPEC). In Latin America and the Caribbean, Atheer’s operations will be driven by Rogerio Moreno, the company’s new General Manager of Latin America. Rogerio has held a variety of sales and business development roles at companies such as Avaya, Foundry Networks, NetScout (where he served as country manager), and Saba Software. The Atheer engineering team is now headed up by Rich Ellinger, who holds a long and rich pedigree of co-founding and growing enterprise software companies. He was the Chief Architect and co-founder of Saba Software, has held the Chief Technology Officer title at a number of enterprises and was a senior software engineer at Oracle Corporation. Rich holds a Masters in Computer Science and a BA in Political Science from Stanford. Meanwhile, Atheer’s new professional services team has been established under the leadership of new Vice-President of Professional Services Petter Andersson. Petter spent 17 years with Ericsson, living and working in 7 countries on 3 continents. He managed Ericsson’s Beijing-based 80-person education and learning services team and, prior to that role, was the Chief Learning officer for the group for more than 6 years - serving the learning needs of more than 100,000 employees. Petter holds a Masters in Business and Economics from Uppsala University in Sweden. Atheer’s new Chief Customer Officer is Ronno Lee. He joined Atheer from ADP where he was in charge of a $700M product portfolio for the large global enterprise market. He helped grow the annual revenue by over $100M and achieve a customer retention rate of over 98%. Prior to ADP, Ronno was running the cloud business at Saba. He was part of the leadership team that transformed the on-premises software business to a growing and profitable cloud business with more than 5 million users and 400 clients. He holds a BSBA from Ohio State University and an MBA from Wright State University. The company’s expanded team will be housed in a new facility in Santa Clara. The new Atheer headquarters are a contemporary office space, featuring an Augmented Reality research and development laboratory and a state of the art Executive Briefing Center. It is custom designed to accommodate Atheer’s expanding leadership, product development, sales, marketing and customer success teams. The company is planning to schedule numerous educational and networking events at the new location. 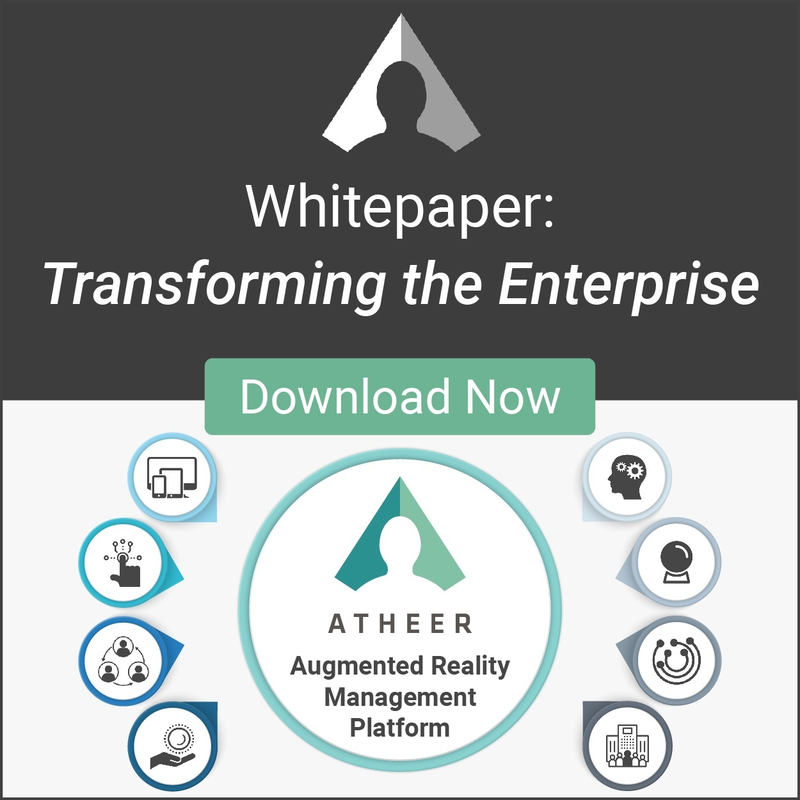 With a comprehensive set of capabilities for industrial enterprise and their most common use cases, a growing constellation of partners, and 62 patents issued, Atheer is fast becoming the standard for AR in the enterprise. Atheer is used by customers such as Porsche Cars North America, which is seeing transformative changes in the way its service teams work – resulting in increased growth, productivity, accuracy and safety. Atheer is the Augmented Reality Management Platform company for industrial enterprises. Founded in 2012, Atheer provides the only enterprise grade solution for contextual work guidance, remote collaboration, and natural interaction across glasses and mobile devices. Global brands such as Porsche, Masimo, and others use Atheer to empower their workers, deliver higher productivity, and enhance their safety wherever they are. Atheer is designed to improve the productivity, quality, accuracy, and safety of industrial workers. Atheer's award-winning platform provides "See What I See" video collaboration and work instruction management to empower the 21st century workforce in areas such as Automotive, Industrial, Logistics, Manufacturing, and Transportation. Powered by 62 issued patents - and validated with key customers including Masimo, Flex, Porsche Cars North America and other leading enterprises - the Atheer platform provides an out-of-box solution for enterprises. It is one of the most hardware-agnostic Augmented Reality platforms available for the industrial enterprise, with announced support for solutions using Windows 10 (on the Toshiba dynaEdge™ AR Smart Glasses), a range of Android-based smart glasses and head-mounted devices (including those offered by ODG, Epson, Vuzix, RealWear) Samsung's popular S2 and S3 tablets and the Safari browser on Apple iPhones and iPads. Visit AtheerAiR.com or follow us on Twitter @atheerair.